Disclaimer: I received this DVD for free in exchange for my honest review. I only recommend products or services I use personally and believe in. I am disclosing this in accordance with the Federal Trade Commission’s 16 CFR, Part 255: “Guides Concerning the Use of Endorsements and Testimonials in Advertising.” Sponsor is responsible for prize fulfillment! Today we are talking about a great Christmas gift idea for your little girls, or for those of us who are still kids at heart. When My Little Pony became a cartoon in 1986, I was already an adult, but I have very strong memories because I was watching the cartoons on Saturday mornings with my little cousins. Those two girls, who rarely agreed on anything, would race to the TV to get it on the correct channel for My Little Pony. Now, we can watch this wonderful series all over again because it is now available on DVD! ALL 65 Episodes are in this DVD set! About My Little Pony: You’re invited to return to Ponyland, the home of all your favorite classic Little Ponies, including the Earth Ponies, Unicorns, Pegasus Ponies, Flutter Ponies, Sea Ponies, Baby Sea Ponies, their human friends Megan, Danny and Molly and, of course, their dragon friend, Spike! Together, they live a life of games, songs and harmony with allies like the Bushwoolies and Furbobs. But, occasionally, there are problems in Ponyland and the Little Ponies of Paradise Estate must face evil witches, goblins, Stone Backs, Grundles and more! 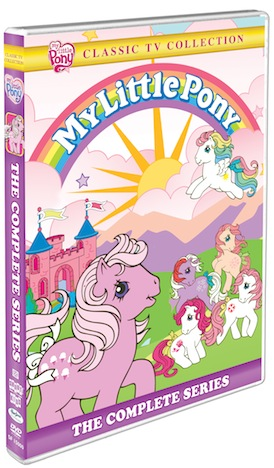 Now you can join in the fun and adventure with My Little Pony: The Complete Series! We are lucky enough to be able to offer one lucky Shelly's Bits and Pieces reader My Little Pony the Complete Series on DVD!! Simply enter on the rafflecopter form below! I would definitely give this to my niece. my boys have decided they are too old for MLP, but I would love to share my love with her. If I won, I would give this to my daughter. She loves MLP! I would love to give this to my daughter! She loves rainbow dash and pinkie pie! I would give this to my daughter! She loves Pinkie Pie!! !